This is a special post for foreign national students studying in the U.S. Future posts in this blog will address the topic of how U.S. emerging professionals can position themselves for work abroad. As a foreign national student, you bring a unique perspective to your educational experience here—one that will certainly benefit both the community at your university as well as potential employers. That being said, if you are seeking employment in the U.S., you need to be informed about cultural norms and employer practices for hiring. Here are seven strategies to help you get started. Cultural practices and expected business etiquette vary by country, by region, and by industry. One frequently sited piece of advice to visitors to a foreign country is "when in Rome, do as the Romans do." This means that when you are visiting a new place, you should observe and act in accordance with the customs and rituals of the residents of that place. 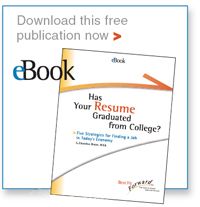 Employers interviewing for internships and full-time positions through your school’s on-campus recruiting programs will expect you to have a basic understanding of unspoken American cultural practices and job search etiquette. Here are seven strategies to help you with this process. 1. Get to know your classmates and your new environment. If this is the first time you have lived in the U.S., you can learn a great deal about unspoken cultural practices through interaction with fellow students, neighbors, and faculty and staff at your university. Additionally, if English is not your native language, you should write and speak in English as much as possible prior to conducting your career search. Fluency in English is generally not a written requirement for U.S. jobs, but employers will assess your ability to communicate effectively during the hiring process. If employers do not feel comfortable with your language skills, they may not offer you employment. Most U.S. universities offer students career services as part of tuition fees. Career Services offices will provide you with an overview of fundamental skills needed for applying for positions both on-campus and off-campus. Take advantage of workshops, programs and resources to learn expectations for resumes, cover letters, and interviewing. If these resources are not enough, consider hiring an external career counselor or coach to provide you with additional assistance. Learn about the market for your skills and experience through attending industry specific workshops and surveying openings posted through your career office and external websites. Employers will expect you to be familiar with general economic trends and industry news for your area of interest. Interviews in the financial services and consulting sectors generally include questions designed to assess your knowledge. Unless you have U.S. permanent work authorization, you should consult with an immigration attorney and your campus’s International office regarding your eligibility to work on a part or full-time basis. Be proactive about monitoring the U.S. Citizenship and Immigration Services website (http://www.uscis.gov) and take responsibility for following guidelines and processes related to U.S. work authorization. Take advantage of individual counseling appointments offered through your university’s career office; staff may be available to assist with you with revisions to your resume and cover letters and frequently offer mock interviews to help you with your interviewing skills. If English is not your first language, have a native speaker screen your application materials to check for grammar and appropriate usage. Make sure you use "spell check" as well to filter out any potential errors. 6. Be curious and apply for positions selectively. Research industries, career opportunities, and areas of interest. Utilize what you’ve learned as you apply for new opportunities. A common mistake among job seekers is to apply for many positions to increase the odds of being selective. A better approach is to apply selectively for those positions that are the best fit for your skills and experiences and are of interest to you. 3. Your knowledge of the organization and industry in which you would be working. 7. Remember that you have unique skills and experiences to offer employers. While the hiring process may be challenging, remember that you have a great deal to offer potential employers. In addition to your skills and intellect, you offer employers a unique perspective that has been developed through your experience in your home country and your U.S. education. In today’s global economy, this is an invaluable contribution.